Matson Navigation Co., the state's largest ocean shipper, is raising its fuel surcharge to a record 26 percent, a move bound to have an effect on Hawaii's already high consumer prices. The 2 percentage point increase, which goes into effect Dec. 2, marks the fifth straight rise this year and tops the new 25 percent fuel surcharge that rival Horizon Lines Inc. announced Oct. 12. Both companies blame the soaring cost of ship fuel for the increases. 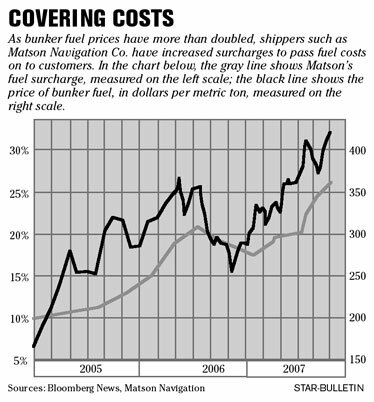 Matson's increase will add $19.50 to the cost of shipping a typical automobile, for example. But consumers eventually will see the increase in many places, including the grocery store. "Our inflation rate is already very high -- 5 percent in the first half of 2007 -- and the fuel surcharge is obviously inflationary," said First Hawaiian Bank consultant Leroy Laney. The state's largest ocean shipper, cautioning that it expects the price of fuel for its ships to continue rising through the end of the year, is raising its fuel surcharge to a record 26 percent. Here are examples of new price increases for shipping goods between the mainland and Hawaii as a result of Matson Navigation Co.'s decision to increase its fuel surcharge up 2 percentage points to a record 26 percent, effective Dec. 2. The move will give yet another unwelcome push to Hawaii's already high inflation rate. Matson Navigation Co., which has now boosted its surcharge five consecutive times since March, blamed the increase on record highs in fuel-related costs created by unprecedented demand for oil in the global market. Matson's increased surcharge, effective Dec. 2, applies to services between the mainland and Hawaii, Guam and Commonwealth of the Northern Mariana Islands. In boosting the surcharge 2 percentage points, Matson leapfrogged the 1 percentage point increase that rival Horizon Lines Inc. announced Oct. 12. That surcharge is effective Nov. 11. Dave Hoppes, Matson's senior vice president for ocean services, said fuel costs have increased more than 10 percent since the company's last adjustment, when it raised its surcharge on Aug. 19 by 1.5 percentage points to 24 percent. Since March, Matson has increased its surcharge 8.5 percentage points from a 2007 low of 17.5 percent. "These (fuel-related) costs comprise a large component of operating costs for the transportation industry, and are unavoidable expenses for transporting goods, both on land and at sea," Hoppes said. "The recent spikes have been unusually dramatic in an already volatile period, and are anticipated to continue through the end of the year." Horizon and Matson typically match each other's surcharge, and Dan Downes, pricing and marketing director for Horizon, said yesterday that Horizon needs to study Matson's tariff filing with the Surface Transportation Board and won't have a comment until next week. Last week, Horizon, the state's second-largest shipper, said in a letter to customers that it was increasing its surcharge to 25 percent to offset a portion of increased bunker fuel costs experienced in recent weeks. Reggie Maldonado, general manager of Pasha Hawaii Transport Lines, said the company was reviewing Matson's and Horizon's surcharge increases and also will have an announcement next week. Pasha Hawaii, which ships vehicles between Hawaii and San Diego, increased its surcharge on Aug. 31 to 21.5 percent from 19.5 percent. The increase in oil prices and, as a result, fuel surcharges, is squeezing consumers and businesses alike. It now will cost $994.50 to ship an automobile on Matson, up from $975. The cost of a 20-pound bag of rice shipped in a 40-foot container will rise by $36 per container, or 1.6 cents per 20-pound bag. First Hawaiian Bank consultant Leroy Laney said the high fuel surcharge is just another example of how dependent Hawaii is on oil. "Our inflation rate is already very high -- 5 percent in the first half of 2007 -- and the fuel surcharge is obviously inflationary," said Laney, a professor of economics and finance at Hawaii Pacific University. "It's related to higher energy costs and, as you know, so many things depend on energy." Laney said the two components driving up inflation costs in Hawaii are housing and energy. "Even though home prices are stabilizing now, the past increases are feeding into the Consumer Price Index," Laney said. "And with energy, you're seeing here with the fuel surcharges how sensitive we are to energy prices here." For companies like Maui Land & Pineapple Co., which earlier this year shut down its canned pineapple business to concentrate on fresh pineapple, the higher surcharges this year have sucked up the additional revenue that MLP hoped to realize from its new $20 million packaging plant. "This 8.3 percent increase in the surcharge (based on actual percentage, not percentage points) pushes Hawaii further and further away from its markets," said David Cole, chairman, president and chief executive of MLP. "We have invested in production improvements in cultivating, harvesting and packaging that's been more than offset by the rapidly rising cost of reaching our customers. In other words, the rising logistics costs, added to our already high production costs, presents a serious challenge to our pineapple business." Although MLP ships some pineapple by air, the bulk of its production is shipped by container. MLP expects to ship 2,000 containers of pineapple, accounting for 36,000 pounds per container, in 2008. "We've shifted dramatically all of our harvesting and post-harvest handling methods to use refrigerated containers, so it hits us pretty hard," Cole said.